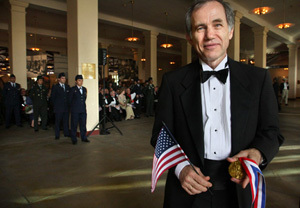 Vasile Beluska with his Medal of Honor in the Great Hall on Ellis Island BOWLING GREEN, OH. For the violinist and political refugee from Romania, life in the United States was a whole new world. Now Beluska, a professor of music performance studies at Bowling Green State University, is being honored for helping other musicians from Eastern Europe come to the U.S. and develop their own careers. 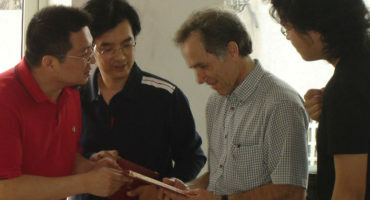 Both in the U.S. and Europe, countless students and others have benefited from his generosity, service and talents. With his family at his side, Beluska received an Ellis Island Medal of Honor on May 10, on that small outcropping in New York Harbor that symbolizes the journey and the arrival of so many seeking freedom and a chance to make something of their lives. The awards are sponsored by the National Ethnic Coalition of Organizations (NECO), a nonprofit organization created in 1984 on the conviction of its founder, William Denis Fugazy, that the diversity of the American people is what makes the U.S. great. NECO's stated mission is “to help create the world of the future today.” It does this through a number of philanthropic ventures. Each year since 1986, NECO has sponsored the Ellis Island medals, which are presented to American citizens of diverse origins for their dedication to: community service, preserving the history of their ancestry group, supporting and defending American values, building bridges between diverse groups here and abroad, and sharing their personal and professional gifts for the benefit of humanity. Past recipients include six U.S. presidents, Nobel Prize winners, athletes, leaders of industry, artists and others whose work has made a lasting impact on humanity. Beluska and his family are a philanthropy unto themselves, according to Dr. Richard Kennell, dean of the College of Musical Arts. “For every success Vasile earns, he readily shares it tenfold with others,” Kennell wrote in nominating Beluska for the medal. “His sense of responsibility to his students is humbling.” He has helped them find sponsors, living accommodations and places to continue their studies while assisting with immigration and visa issues. He regularly hosts them for dinner at his home and helped organize a benefit concert for one with a life-threatening illness. He has also worked hard to preserve Romanian traditions in both Romania and America and has passed those values on to his students, Kennell said. One student has established the American Romanian Festival, which supports the cultural exchange between the U.S. and Romania; another Romanian student has formed a talent agency that features Romanian musicians and ensembles. Beluska began his musical career in his hometown of Cluj-Napoca, in Transylvania, where he studied, and later taught, violin. He was the concertmaster of the school orchestra of the Lizeul de Muzica in Cluj. The orchestra won a countrywide orchestra competition, which was to have earned it a trip to Sweden. Though that did not happen, it planted the idea within him to help his colleagues make contact with the West. Several years later, Beluska and his brother defected from the repressive regime of Communist dictator Nicolae Ceausescu. The two eventually made contact with representatives of a private refugee camp in Lavrio, Greece, and spent eight months there before coming to the U.S. Last year, while on a College of Musical Arts trip to work with colleagues in Corfu, Beluska revisited the camp that was the first stop on his journey to the West and was happy to see a woman who still worked there almost 30 years later. “The camp still looks the same,” he said. Through the auspices of Catholic Family Services, Beluska and his brother were sent to Amarillo, where his brother worked at Bell Helicopter and Vasile loaded Levis at the local airport. The agency helped them get situated in their new city. “We had to learn to buy groceries, go shopping, look for work, rent an apartment. They taught us to do all these things. It was a beautiful little town,” he remembers fondly. Instead of the mountains he was used to in Transylvania, “the relief goes backward,” with canyons dipping below the horizon, he said. Far from his classical music roots, Beluska formed a band with his new friend Jeff Valdez, playing soft rock, country, jazz and even Romanian folk tunes. “I had to learn to play lead guitar. I met my wife while I was playing in that band. We usually talked to the audience between sets,” he said. His wife, Donna, was then a student at West Texas State University. “She asked me what I saw for myself in the future and encouraged me to pursue my highest dream—to be a violin professor,” he said. 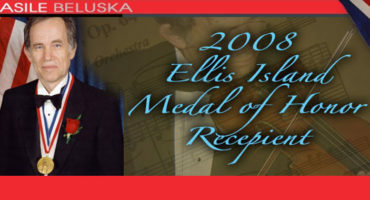 Beluska earned a master’s degree at Southern Methodist, in Dallas, and was hired at the University of Northern Iowa, where he found great support in Dr. Ronald Ross, the director of the School of Music. With his wife’s and Ross’s encouragement, Beluska applied to be in the class of renowned violinist Jascha Heifetz, “and to my surprise, I got in,” he said. Beluska was hired at BGSU in 1986. Since then, he has given master classes and performed in his native Romania, as well as across the U.S. and Europe and in China, Greece, Mexico and Canada. He has played at the U.S. Capitol and the Kennedy Center, the Mozarteum in Salzburg, Austria, and Carnegie Hall, among other venues. The first student he helped enroll at BGSU came in 1991, and the stream has not stopped. There are several from Cluj here now, including a pianist, trombonist, violist and violinist. Others have come from Russia and China. Beluska is quick to share the credit for bringing foreign music students to BGSU with Kennell. “Dean Kennell was a trailblazer in finding ways to help these students. Not much would have happened without him,” he said. As for the students, “usually we get the best of the best,” Beluska said with pride. “Some who have graduated still live here,” he added, such as Vasile Chintoan and Cristina Muresan, now violinists with the Toledo Symphony, and Ioana Galu, who is on the music faculty at Heidelberg College. Others move far away, like the former student who is now on the faculty of a music college in Lima, Peru. 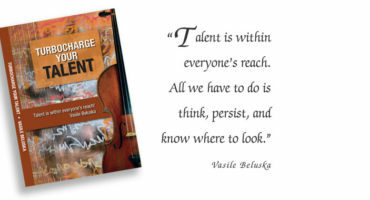 “The native sons and daughters who return to Romania after studying and living in the United States through Vasile’s efforts continue to bring new ideas, hope and talent back to their homeland,” Kennell said.